Hawaii Braces For Hurricane Lane, Now A Category 4 The National Weather Service issued a hurricane warning for Maui and Hawaii's Big Island. Forecasters were predicting flash flooding and landslides. A satellite image shows Hurricane Lane in the Central Pacific Ocean on Wednesday. "The center of Lane will track dangerously close to the Hawaiian Islands from Thursday through Saturday," the weather service said. "Regardless of the exact track of the storm center, life-threatening impacts are likely over some areas as this strong hurricane makes its closest approach." 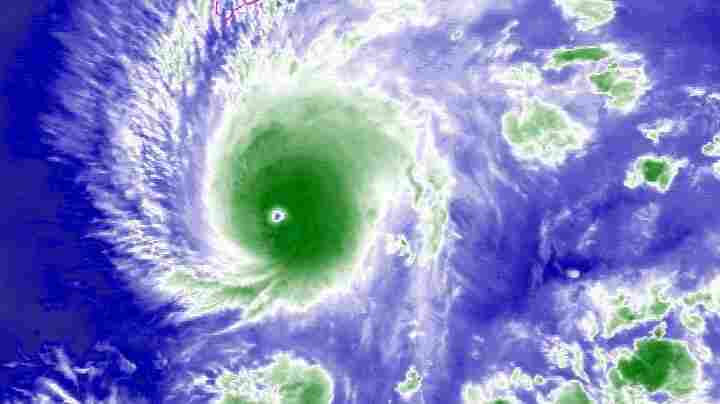 A hurricane warning is usually made about 36 hours before tropical-storm-force winds are expected to hit a location. Residents "rushed to stores to stock up on bottled water, ramen, toilet paper and other supplies" as the storm neared, The Associated Press reports. Lane's maximum sustained winds were about 155 mph, the National Weather Service said, which will slowly weaken over the next 48 hours. But the agency cautioned, "Lane is forecast to remain a dangerous hurricane as it draws closer to the Hawaiian Islands." The service said hurricane conditions are expected within the warning area, in Hawaii County, on Thursday, while tropical storm conditions would affect the "watch" area starting Thursday. Flash flooding and landslides are expected, with total rain accumulations of 10 to 15 inches forecast; certain areas in Hawaii may be deluged with more than 20 inches of rain. "Large and potentially damaging surf" will affect exposed shorelines facing the west, south and east, the NWS said. Gov. David Ige signed an emergency proclamation Tuesday to "provide relief for disaster damages, losses and suffering" caused by the hurricane. It declares counties of "Hawai'i, Maui, Kalawao, Kaua'i and the City and County of Honolulu disaster areas for the purpose of implementing emergency management functions," his office said. "Hurricane Lane is not a well-behaved hurricane," Ige said in a statement Tuesday. "I've not seen such dramatic changes in the forecast track as I've seen with this storm. I urge our residents and visitors to take this threat seriously and prepare for a significant impact." State offices on Hawaii island and Maui will be closed Wednesday through Friday. The governor announced that nonessential state employees in the two counties will be put on administrative leave. All public and charter schools in the two counties will be closed Wednesday until further notice, the Hawaii State Department of Education said. Longtime Hawaii residents were reminded of the destruction caused by Hurricane Iniki in 1992, which according to Hawaii News Now, made landfall on Kauai island in September of that year as a Category 4 storm with 145 mph winds. That storm killed six people and caused $1.8 billion in damage, including to food crops, and destroyed or damaged thousands of homes and buildings. "A lot of people are comparing the similarities between Iniki and Lane," Kauai resident Mike Miranda told the AP. "I remember how very little rain fell. But I remember the wind being the strongest force of nature I've ever witnessed and probably the scariest sounds I've ever heard in my life." An earlier version of this story said Hurricane Lane's maximum sustained winds were about 1655 mph. Its maximum sustained winds were actually about 155 mph.